People sometimes ask WHY we have ponies. Perhaps it all started when I was a toddler and fed the donkey. Maybe it is due to the ponies I rode at the zoo as a child, where I positioned myself in line in order to ride the pony of my choice (see left). Mostly, though, we have ponies because of a wonderful pony named Boots. As young children, my sister and I read all the horse books and begged for horses of our own. We had access to a variety of mounts belonging to friends and neighbors and were fortunate to ride fairly often, but we were not satisfied. Probably because I was older, I got my horse first. He was a most unsuitable choice for an eleven-year-old girl. He was a yearling half-Arabian, half-American Saddlebred colt. That's right--a young stallion. What were we thinking?! When we bought him, he was very skinny, and his mane and tail were completely matted with cockleburs. However, he had beautiful eyes, and he was cheap. The colt was sweet, kind, and high energy. 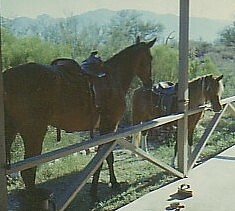 We had him for years (and yes, he was gelded eventually--my parents wisely arranged for this without my knowledge or permission!). He grew to be quite large at 16 hands or so, and it annoyed me that I couldn't see over his back and struggled to lift the heavy saddle over my head to put it on him. I also had a hard time getting ON this large horse. My sister was five years younger than I. By the time we got around to looking for a horse for her, we had wised up. We wanted an older, trained animal that was appropriately sized for her to care for and ride. One very memorable day, we drove to see an old man's herd of ponies. He was dispersing his beloved pony herd and retiring from the pony-ride business. We followed him into a large pasture. There were no ponies in sight. He whistled, and within moments, we heard the sound of thundering hooves, and a big band of ponies came running over the hill to meet us. They were breathtaking! The ponies gathered around us in a group. They were healthy, happy animals of many sizes and colors. Our minds were spinning. How does one choose a pony out of so many? The answer became clear when one of the ponies introduced himself to us and kept licking my Mom's pants. His name was Boots. He sold himself, as ponies often do. Boots was a seven-year-old gelding, trained to ride and drive. He was three-quarters Welsh and one-quarter Shetland. At 45 and 1/4 inches in height, he was just the right size for my sister. He had seen it all, done it all, and loved doing it. We bought Boots for $75. For another $25 we purchased his custom-made saddle and bridle. My sister and I went riding every day, every summer, year after year. We rode as much as possible in winter as well. We rode all over the countryside in southwest Michigan where we grew up. A favorite route of ours traveled through the fields and woods to the fairgrounds, where we practiced in a show ring, and then rode back to the pasture and barn. Sometimes we would get together with a bunch of our friends on horseback and ride as a group. Every now and then we would grab apples off the trees to eat and share with our horses. One day we sampled some raspberries, and the owners yelled and came after us. We galloped to a nearby orchard and hid in the trees. That was scary! (We didn't go there again.) Several times we went swimming in the river with our horses. (I'm not sure our parents knew about that.) We often rode to the nearby grassy airstrip and let the horses gallop flat out down the runway while we rode like jockeys! Boots was a fabulous pony. He was brave and never refused to go anywhere or do anything. My horse was suspicious and afraid of everything, but he would follow Boots--over logs, through water and mud, past "monster" rocks, across lines painted on the road, into a horse trailer, and so on. Without Boots in the lead, I would probably still be "stuck" on my horse somewhere, unable to overcome some obstacle. My horse and Boots became good buddies, though they looked pretty funny together--the 16-hand horse and the 11-hand pony. Occasionally, we took our animals to local horse shows and fairs. I could count the ribbons I won on one hand, and none of them were blue. 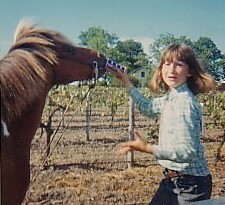 My sister and her pony, however, were always in the ribbons. At his first show in a large pony halter class, the judge had him sixth in the line. Then Boots moved himself up, dragging my sister with him! The judge agreed and awarded them second place. Afterwards, Boots celebrated by having a soda! He enjoyed drinking pop on numerous occasions after that. At one show, our family was standing around with Boots, when he stuck his head in a trash can and came out eating a hamburger! Boots always placed in every class, whether in-hand or under saddle. Judges loved him. He was irresistible. In one costume class, he was the only pony left standing after the knight-in-shining-armor entered the ring. The others fled! There was nothing this pony couldn't do. He moved well, and he was cute. Boots did have a few quirks and taught us how to properly treat a pony. He demanded respect. We learned never to tap a pony with a stick to make it go faster. We learned never to go between a pony and his food. We learned that no fence or cattle guard could hold this pony if he wished to leave. We were amazed to learn that Boots could maintain a fast canter (with my sister on board) between long rows of corn, grab a cob on the run, and emerge at the far end eating his ear of corn without breaking stride. Best of all, we learned to love ponies. Boots was a delightful character with a charming, fun-loving personality. We are so thankful that Boots joined our family. Eventually, my sister grew taller (actually, a lot taller). Boots happily carried her until her legs hung down past his knees. I'm sure he would have gladly carried her forever with no complaints, but Boots went to live with another family to teach another young girl all about ponies. It was a sad day for our family when he left. Years later, as I reflected on fond memories of Boots and the fun we had, I decided to investigate several breeds of ponies with the idea of purchasing two or three mares. I attended the 1992 American National Welsh Pony & Cob Show and fell head-over-heels for the Section B colt Bristol Victorio. One year later, I picked Lace out of the Victorio filly crop. Her sparkle and attitude caught my eye and won my heart. In late summer of 1992, I attended the West Coast Connemara Show to see Connemara Ponies in person for the first time. I was very favorably impressed with their quiet temperament, willingness, and athletic ability. Two years later, it was love at first sight when I found Crystal, the daughter of one of the stallions I had admired at the show. Lace and Crystal are the foundation broodmares of Wintermist Farm. Another question sometimes asked is, "What do people DO with ponies?" Everything! The list is endless but includes English, Western, dressage, driving, showing, and trail riding. Ponies are competing successfully in almost all disciplines with handlers of all ages and abilities. Perhaps best of all, ponies are providing enjoyment and unforgettable memories to people all over the world. If you have ever had a wonderful family pony, you know what I am talking about. Our little pony farm is a dream come true for me. Best wishes!